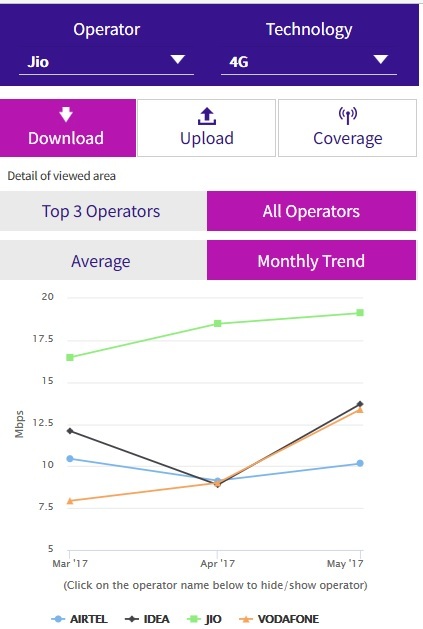 According to TRAI myspeed app, Jio has been India’s fastest 4G network since Dec-2016. This is big achievement for Jio as they are providing true 4G services without charging extra money like Airtel, Idea and Vodafone is charging. On the other hand, there is some hike in speed of Vodafone and IDEA which is good for Digital India. TRAI myspeed is best and accurate platform to test your operator's real download and upload speed. According to TRAI, Jio is providing 16 to 19Mbps which is improving every month. To be noted, Jio has scored all-time high download speed of 19.12 Mbps which is much better than other leading operators of our country followed by IDEA and Vodafone. As soon as it become public that Jio is still leading in top 4G speed providers since last 4 month, Airtel has started Ookla campaigns again. Why Airtel is doing Ookla Campaign again? The answer is Airtel is not scoring good in TRAI myspeed results. According to TRAI speedtest results, JIO is fastest Network since last 4 months. So, Airtel is again worried as their speed is not good as competitors. When Airtel started their Ookla campaign for the first time and claimed that they are fastest network as per certificate issued by a foreign private company ookla, Jio filed a complaint against their misleading ad. After this complaint, ASCI found Airtel Ad is misleading and ordered to modify or remove it from all channels asap. They have accepted that their methodology is greatly flawed when it comes to Android dual SIM devices. As you can see, Jio is twice as faster than Airtel, so Airtel has surely bought certificate of being faster from ookla. For the month of April, Jio has recorded an all-time high download speed of 19.12 Mbps, which nobody can neglect as TRAI myspeed is highly accurate. These days people are watching Ookla Ad again on Tv. Why? Why Airtel is ignoring order of ASCI? Why Ookla Ad is back again? Is showing certificates makes you fastest network? if yes, then i can buy 100 of certificates from private companies and can start a new telecom company. I can prove 2G network is fastest then 4G, just with a certificate from a private company. But i will be fastest only when i am giving better speeds from other opertaors and not bunch of certificates. ASCI asked Airtel to stop their campaign, but they are still showing OOkla campaign, isn't it a disrespecting act by Airtel? yes it is as ASCI is self regulating authority. The Ookla certificate, which shows Airtel is fastest is valid for Q3-Q4 of 2016 and now it is like 1 year more and they are still using old certificate. Come on Airtel grow up, you cant use old certificates to prove you are fastest in market, please live in present. OpenSignal report was failed to prove that Airtel is fastest. Why Airtel had stopped current campaign and rerunning already banned campaign? These days, Airtel was so busy with their new " Next Gen Smart Network campaign and now they are running old ookla campaign again. Anyone know why? The answer is TRAI Speed test result. For the month of April, Airtel scored quite low in terms ofG speed as per TRAI myspeed data . So, their panic of slow speed forced them to use banned ookla campaign again. In Mid April2017, A new campaign “next-gen’s smart network” was launched by Airtel, which was focusing on enhancing smartphone user experience. They were showing that in near future your smartphones will become capable of doing many things and for that smart phone you need a smart network which is Airtel. This campaign was running successfully and focused much more on services like payment bank, anti virus, add on services etc. But now in June, they switched back to old campaign which was already banned by ASCI. Shouting again and again that we are fastest can make you fastest? is it so guys? How can Airtel advertise a banned TVC? Since last Months, Airtel is failed to improve their network speed and they are not fastest according to TRAI myspeed App. They can't improve their network anymore as they are spending all their revenue in false campaigns, so they are now desperately trying to become fastest with ookla campaign. ASCI which is power of Indian consumers, already told to stop ookla and many more campaigns but still Airtel is showing them, isn't it disrespectful towards reputed organization? Advertising Standards Council of India, ASCI was founded in 1985. It is a self-regulatory organization (SRO) for advertising content. You can see many Ads, which are false in reality and as consumers, we really don't know if the claim in Ad is truth or not. If someone knows that there is false information in any type of digital Advertisement, then you can ask ASCI to help you with it. ASCI usually find misleading advertisement and ask brands to stop promoting them. As ASCI is self regulatory organization, no one can put limitation on their work. This is good because, they can do their work without any political interference. The good thing is, everybody follow ASCI decision. This is not the first time Airtel ignored ASCI decision, they ignored ASCI many times in past too. Here I will show you where and when Airtel found to be guilty and never stopped misleading advertisements. June 6, 2017, Free Data for 12 Months. According to this advertisement, Airtel is giving free data for 12 months which is worth Rs 9000. ASCI found this advertisement as misleading as they are offering data for switching to AIrtel 4G. Also, the normal 3G price for 3GB data was RS 450 which is 5400 Rs for 12 months but Airtel is saying it is worth Rs 9000, which is false information. It is same as road side stalls who first ask for 3 or 4 times higher price and then customer do bargain and pay them more than double of its actual cost. The third mistake is, 1 month is 28 days for data packs, so if you are doing 12 recharges, it will not add up to 12 months. this shows how Airtel is playing with words. June 6, 2017, Free Unlimited local + STD calls : Advertised Unlimited but there was a 1200 minutes per week limit. April 18, 2017: Airtel was giving Free local and STD call and a free upgrade for Airtel-V fiber, but on the other hand they are asking for Rs 149 to get this offer. March 31, 2017: Declaring itself as fastest network by getting certificate from a private company. October 2016: Best Network in country campaign while they don't have strong network. October 2015: Airtel 4G is fastest challenge, where Airtel will pay your bill if any other network found to be faster than Airtel. So many times, Airtel was found guilty, but they had never accepted their fault and the reason they are losing their customers. You can watch TV and it is guaranteed that you will see banned Ads of Airtel. This is truly shameful display that they are not giving any respect to ASCI nor to their customers as giving False information is worst than disrespecting someone. Airtel just want to make innocent customers fool and nothing else. Airtel can spend a part of their advertising budget on their network but not doing as they are super lazy.